1 Year Limited Warranty . Need help? Please contact VIGO customer support at 1-866-591-7792. Custom-fitted bottom grids offer protection for your sink from dishes and utensils. Our stainless steel grids are dishwasher safe. Floating grids are available for select SILGRANIT sink families. BLANCO accessories offer the highest quality in material and workmanship. A wide range of custom accessories complement BLANCO kitchen sinks, offering added convenience and style. BLANCO accessories are available for both undermount and drop-in sinks, as well as Stainless Steel and SILGRANIT. models. Custom-fitted stainless steel bottom grids offer protection for your sink bowl bottom from scratching. Grids sit on the sink bottom on non-skid protective feet allowing water to drain below dishes. An opening in the grid allows easy access to the drain. Custom-fitted stainless steel bottom grids offer protection for your sink bowl bottom from scratching. 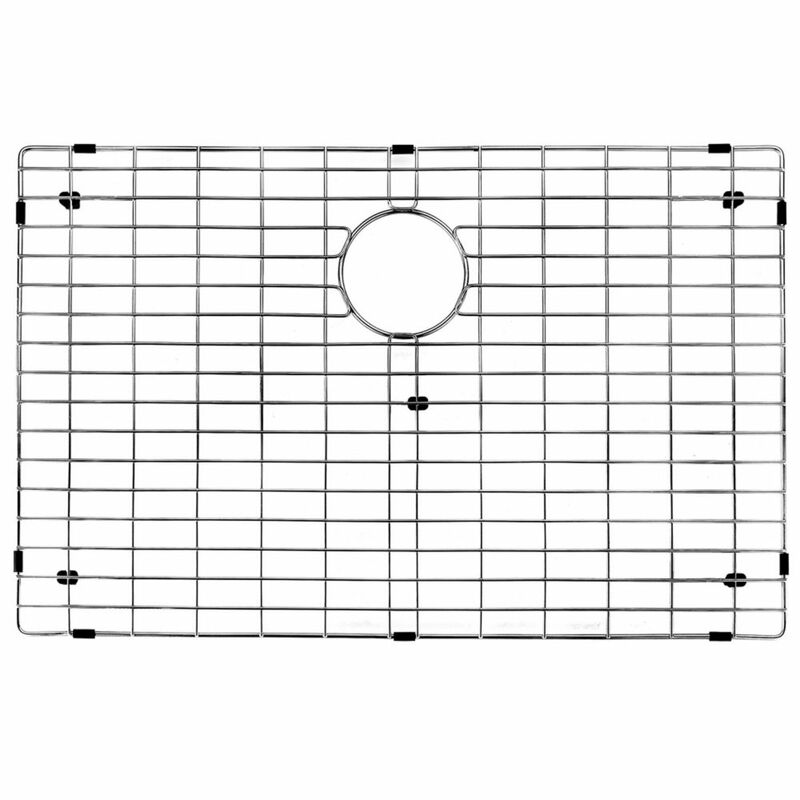 Grids sit on the sink bottom on non-skid protective feet allowing water to drain below dishes. An opening in the grid allows easy access to the drain. Stainless steel grids can be washed in the dishwasher. These versatile and heat-resistant grids can also be used on the countertop for cooling baked items. Available in store by Special Order Only. See associate for details. Chrome Kitchen Sink Grid 27 Inch by 16 Inch is rated 4.6 out of 5 by 18. Rated 5 out of 5 by AnaB from This is great! Only thing I regret is not buying... This is great! Only thing I regret is not buying it sooner. It fits just right and can be moved easily if you need to clean the sink. I would definitely recommend it if you want to protect your sink from scratches, etc. Rated 5 out of 5 by lk from I wish I had ordered this with my VIGO sink, but alas, I didn't think I needed it. This grate ke... I wish I had ordered this with my VIGO sink, but alas, I didn't think I needed it. This grate keeps everything off the bottom and is easy to spray water around. It fits my Vigo 30" x 18" sink perfectly and came with several extra plastic feet that I am sure I will need in the future. Rated 5 out of 5 by Upset from Perfect. ... Perfect. Rated 5 out of 5 by William from Fits well and prevents scratches on the bottom.... Fits well and prevents scratches on the bottom. Rated 1 out of 5 by LC from No - we had to return this. The size on... No - we had to return this. The size on the home depot website is not correct. The actual size of the sink grid is 27 3/4inch x 16 3/4 inch. Quality seemed to be fine and sturdy if size was correct.